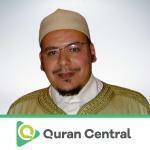 Omar Al Kazabri is born in 1974 in Marrakech, Morocco, Omar Al Kazabri is an eminent and prolific Qur’an reciter and Imam who had control over Quran memorization at the tender age of 11. In order to learn in depth about Islamic Fiqh, he joined the Islamic Institute of Makkah while simultaneously doing Imamat at Jeddah’s University mosque. He worked hand in hand alongside Sheikh Ahmed Al Massarweh on “The Ten Recitations Achievement”. Omar Al Kazabri premiere Imamat experience was when he conducted the prayers in Ulfa’s mosque (Casablanca, Morocco) and he also irrefutably was designated to lead the prayers as an Imam and Reciter of the coveted Hassan II mosque.